An elegant set of 97 rooms and suites are divided into 9 large houses with arches and domes Mediterranean architecture where white predominates. These large villas on 2 floors are accessible by stairs, each named after a Greek island. Reception, room service, tours desk, car rental, salon, laundry and pressing, 3 shops (newspapers, fashion and jewelry), babysitting on request. The resort boasts an unusual vegetable grown in the hydroponic farm and organic garden, fruit and vegetables grow in the water! Guided tours are held several times a week to find out all the secrets of this unique culture. Mecca of gastronomy, 5 on-site restaurants offer an innovative and varied cuisine based on vegetables, spices, fruits .. from his garden. Guarantee healthy and balanced products! For your well-being and relax, the Venus Spa is spread over 2700 square meters. A wide range of treatments, massages and personalized outdoors or in one of 16 treatment cabins are available. Traditional massage techniques combine with natural elements like shells or stones heated sea, aromatherapy essential oils to restore energy, spa .... quickly feels zen! A diverse menu of spa services incoporate a beautiful, tranquil setting, fresh and organic ingredients, heakin waters and culting-edge techniques. To find out more about our services or to schedule an appointment prior to your arrival at the resort please call 264.498.2000 and ask to be connected to the Venus Spa. For those who wish to continue, begin or refine their fitness regimen while on holiday, our personal trainers are here to put you through your paces. From yoga to the “full body assault” you’ll be as relaxed or as challenged as you want to be. If you want to work on your game, golf and tennis conditioning are also available on-site. Want to laze on the beach or enjoy the many sports activities, CuisinArt offers a wide range of activities throughout the day. Scuba diving, fishing, tennis courts, fitness coach, kite surfing, golf course (facing the hotel). Located facing the hotel, the beautiful 18-hole course, par 72, the CuisinArt Golf, desinged by Greg Norman, delight golfers of all levels. While working your swing, you will enjoy the magnificent views of the islands of Anguilla and St. Maarten and the Caribbean Sea. 1st hole: A spectacular vista of St. Maarten and the Caribbean Sea awaits players at the tee box of the 390-yard starting hole. The fairway descends over 40 feet to a narrow, two-tiered green sitting precariously on the edge of a saltwater lagoon. Robb Report called this first hole "The Caribbean's answer to the 18th at Pebble Beach." 16th hole: Large seagrape trees on the left and the Merrywing pond on the right frame the perilous drive on the 440-yard 16th hole that plays into the tradewinds and ends with an elevated green surrounded by water and protected by deep bunkers. Clubhouse, restaurant, shop, driving range, putting green .. The island of Anguilla is reached by small ferry (about 20 minutes) from the Marigot ferry terminal on� Saint Martin' island served by many national and international airlines. Daily rotations from 8:15 am from St. Martin until 7pm (crossing every 45 minutes). ��� Airline: Air Canada (AC). Located in the main building, on first floor, the "Luxury"� room spacious and comfortable opens onto a private balcony overlooking the beautiful pool waterfalls. Verry Mediterranean atmosphere white tones blue, yellow blend gracefully bamboo furniture, rattan or exotic wood. Air conditioning, fan, telephone, safe, minibar, flat screen TV with DVD / VCR player, free WiFi access, dressing room, sitting area. The bathroom is marble bath and separate shower, double sink, hair dryer, bathrobes, separate toilet. The "Luxury" room accommodates 2 adults and 2 children under 12 years. Located in ground floor, beachfront, the Junior Suite opens onto a private terrace, waterfront. Very spacious (82 m�), it offers comfort and elegance for a living room with confidence. A very Mediterranean variation of white tones, blue, yellow blend gracefully bamboo furniture, rattan or exotic wood. On the 1st and 2nd floor of the villas seafront, very spacious (92m �), the Luxruy Junior Suite opens onto a large balcony with panoramic views with sun / private sun deck. A very Mediterranean variation of white tones, blue, yellow blend gracefully bamboo furniture, rattan or exotic wood. Located on 1st and 2nd floor of the villas, the One Bedroom Suite, waterfront, opens onto a large private terrace with an outdoor shower and a lovely view. Very spacious (160 m�), it offers optimum comfort. A very Mediterranean variation of white tones, blue, yellow blend gracefully bamboo furniture, rattan or exotic wood. Large master bedroom with sitting area, private bathroom, dressing room and solarium. The bathroom is marble bath and separate shower, double sink, hair dryer, bathrobes, separate toilet. Separate�spacious living room and guest bathroom. Air conditioning, fan, telephone, safe, minibar, flat screen TV with DVD / VCR player, free WiFi access, dressing room, sitting area. Located on the1st and 2nd floor of the villas waterfront, the Two Bedrooms Suite (250m�) offers comfort, well-being, elegance and refinement. It opens onto a large balcony with a stunning view of the sea and St Martin's island. A very Mediterranean variation of white tones, blue, yellow blend gracefully bamboo furniture, rattan or exotic wood. Large master bedroom with sitting area, private bathroom, dressing room and solarium. The bathroom is marble bath and separate shower, double sink, hair dryer, bathrobes, separate toilet. Separate spacious living room, second bedroom with bathroom. Air conditioning, fan, telephone, safe, minibar, flat screen TV with DVD / VCR player, free WiFi access, dressing room, sitting area. These two magnificent suites are located on 2nd floor of the main building. They provide multiple terraces and enjoy an exceptional view of the sea and the island of Saint Martin. Penthouse 2000 covers about 300 m� and opens onto a terrace of 80 m�. Large master bedroom with en-suite marble bathroom, 2 further bedrooms with en suite bathrooms, large living room and kitchen. Penthouse 2001 covers about 325 m� and opens onto a terrace of 70 m�. Large master bedroom with marble bath, two additional bedrooms with private bathroom, possibility of a 4th bedroom or office, large living room, dining room, sundeck and whirlpool. When connecting the 2 suites, you have a private floor with 7 bedrooms and a living area of 800m �. The Cafe Mediterraneo, in relaxed atmosphere, facing the pool and sea view, opens for breakfast and lunch which offer light meals, snacks, salads, pizzas. The Bistro at Santorini, in an atmosphere "French bistro" is open for dinner and serves traditional gourmet cuisine � la carte. The Beach Bar & Grill, waterfront, is open for lunch and dinner. It offers cuisine inspired by local flavors, small fish, grilled meats and kebabs. In the evening, enjoy the view of St Martin illuminated. Italia at CuisinArt Golf Club, panoramic view of the beach and the sea, the restaurant, located in the golf clubhouse is open for lunch and dinner. The Chef offers specialties flavors of Italy, fresh pasta traditional food "homemade" ... or just a pizza, panini and tiramisu! Tokyo Bay and its splendid views of the sea and Anguilla, opens its doors for dinner, this is the first Japanese restaurant in Anguilla, you will enjoy the best sushi, sashimi, teppanyaki and Omakase of the island .... fish and seafood fresh sins, vegetables and herbs picked from our hydroponic farm! One of the two bars is located in the lobby of the hotel, overlooking the pool, you will savor the specialties of exotic fruit juices and cocktails. The Beach Bar, feet in the sand, known for its "Happy Hour", is the ideal place to sip a cocktail while watching the sunset. Designed by: Greg Norman, two-time British Open Champion. Greg Norman, knowned as " Great White Shark ", he was the number one ranked player for 331 consecutive weeks. His 25-year career served him to develop his interest in golf course design. 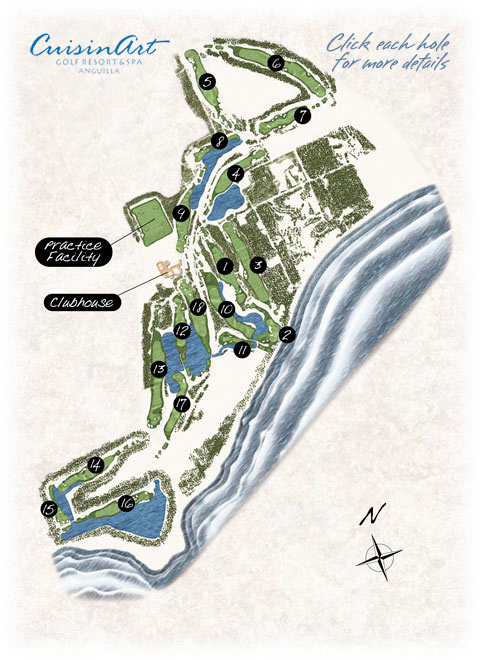 First established in 1987, Greg Norman Golf Course Design has realized more than 70 golf courses on six continents. Norman's golf courses have garnered numerous awards, like Audubon Society Award. CuisinArt Resort & Golf is close to the hotel. The ClubHouse, the restaurant and the pro shop offer quality services. Golf Shop has all the new products, accessories and clothes of Greg Norman, Fairway and Greene and also some equipments. Appropriate dress is required, including suitable lenght shorts or slacks and a collared shirt. Inappropriate dress includes exercices clothing, swimwear, cut-offs, halter tops and tube tops. Inaugurated in 2006, the golf offer a spectacular view and one of the most wonderful exprecience in the Caribbean. We invite you to enjoy of golf experience in the Caribbean, where the sand, the wind and the cristal water will seduce you! You will improve your swing!! 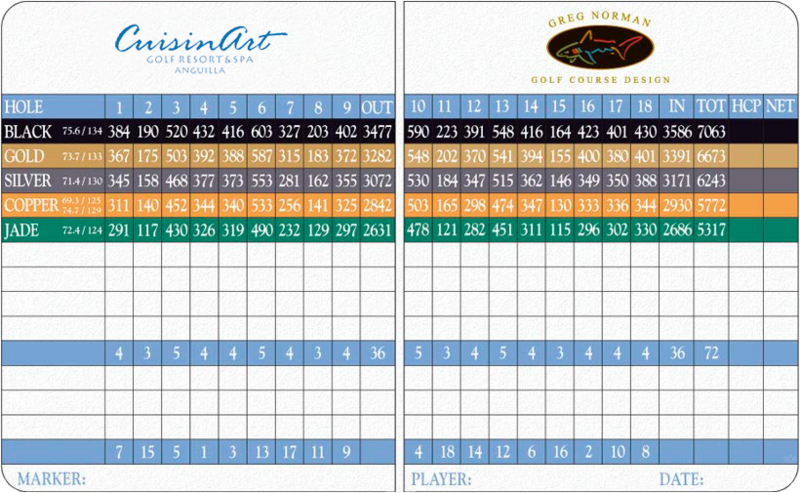 This natural lawn, designed by Greg Norman (PAr72/Rating 75.6) offer a challenge at each player golf. The sea, the beach and St Martin island view brings an additional pleasure. The driving, the practice and the putting green are available. CuisinArt Resort & Golf has been selected to host the 4th Great Golf Resorts of the Wold annual meeting in November 2016. CuisinArt Resort & Golf is one of only three Caribbean resorts selected for membership.